If there is one piece of baby gear that I feel actual attachment to, it’s my Ergobaby carrier. In many ways, it served as an extension of my body as I traipsed all around New York City with my babies comfortably nestled against me while they cuddled, slept and nursed. I definitely think that my children and I benefitted from the babywearing bond, and Ergobaby has come a long way since my babywearing days! They now offer several additions to their original carrier featuring versatile designs to fit the needs of a broad spectrum of parents and babies. Together with my family, I had a look at Ergobaby’s Four Position 360, their newest carrier, at a fun, family-focused event at The American Museum of Natural History. This new carrier allows for four different ergonomic carrying positions: front-inward, hip and back carry and for the first time, front-outward. 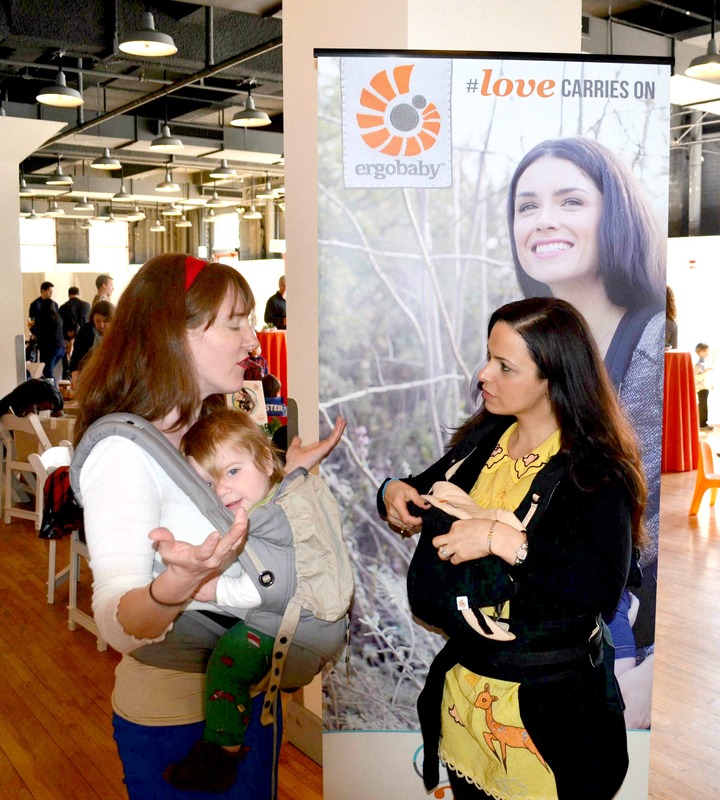 The Four Position 360 carrier was designed to meet the needs of parents requesting more carry options for the six-month-old-plus baby seeking intermittent periods of facing outward. I tested the carrier (sans baby) with the assistance of Ergobaby brand ambassador and postpartum doula Erica. I immediately noticed the secure feel of the extra wide velcro waistband that can be adjusted in both high and low positions depending on your preference and baby’s age. I learned that the thickly padded shoulder straps help to evenly distribute baby’s weight along with the wide waistband for a comfortable carry. The structured, ergonomic bucket seat allows the adult to narrow the seat with the adjustment of two buttons for a safe and comfortable forward-facing outward position that ensures proper spine and hip alignment. I happen to love the continuation of the sleeping hood, which helps to keep baby’s head in place while sleeping and also functions as a great nursing and sun cover. Like all of Ergobaby’s carriers, the Four Position 360 is designed to grow with the changing needs of babies allowing parents to respond to their cues while keeping them close. The Ergobaby Four Position 360 carrier will be available for purchase on April 17, 2014 on their website for $160.